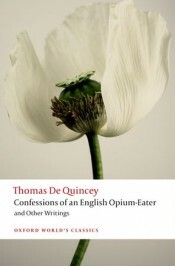 Thomas De Quincey produced two versions of his most famous work, Confessions of an English Opium-Eater. He launched himself to fame with the first version, which appeared in two instalments in the London Magazine for September and October 1821, and which created such a sensation that the London’s editors issued it again the following year in book form. Thirty-five years later, as volume five of his own fourteen-volume selected edition of his writings, De Quincey published a second version, which was much longer than the original, and which contained his final reflections on more than half a century of drug use and abuse. De Quincey himself was an astute analyst of the central difference between the two texts. As he explained it in a letter to his youngest daughter Emily, the 1821 version was ‘an almost extempore effort, having the faults, the carelessness, possibly the graces, of a fugitive inspiration’, while the 1856 revision was ‘a studied and mature presentation of the same thoughts, facts, and feelings, but without the same benefit from extemporaneous excitement’. Recently I sat down with John Cooper Clarke to discuss both versions of De Quincey’s book. Clarke – celebrated performance poet and long-time admirer of De Quincey – is the host of a new episode on the Confessions in the BBC4 series The Secret Life of Books. In two wide-ranging conversations, Clarke and I discussed the history of opium (derived from the same poppy plant as heroin), St Augustine and Jean-Jacques Rousseau as De Quincey’s two key predecessors in the confessional mode, the depths of De Quincey’s involvement with the drug, and the many medical, ethical, and literary responses to the two versions. Filming took place in London, where De Quincey produced most of the 1821 text, and Edinburgh, where he wrote the 1856 revision. There was also a notable stopover in Grasmere. It is not Clarke’s favourite spot in England! But De Quincey lived there for many years in Dove Cottage, formerly the home of his literary idol William Wordsworth, and next door is the Jerwood Museum, where the Wordsworth Trust now houses the manuscript of the 1821 version of the Confessions. It was a remarkable experience following Clarke following De Quincey. Of all the topics we discussed, perhaps the last was the most evocative. Many, many people have written about drugs since De Quincey published the first version of his Confessions nearly two centuries ago. Why do his accounts still stand pre-eminent, especially as so much has changed in our attitudes and policies, including the fact that in De Quincey’s day opiates were legal and widely available as analgesics and catholicons, whereas for us they are closely associated with criminality and restriction? To some extent, it is because De Quincey was the first to memorialize his experience in a compelling narrative that was consciously designed to engage a mass magazine audience. But it is also, and perhaps more centrally, because in the Confessions he put in place all three of the most formidable narratives of drug experience. 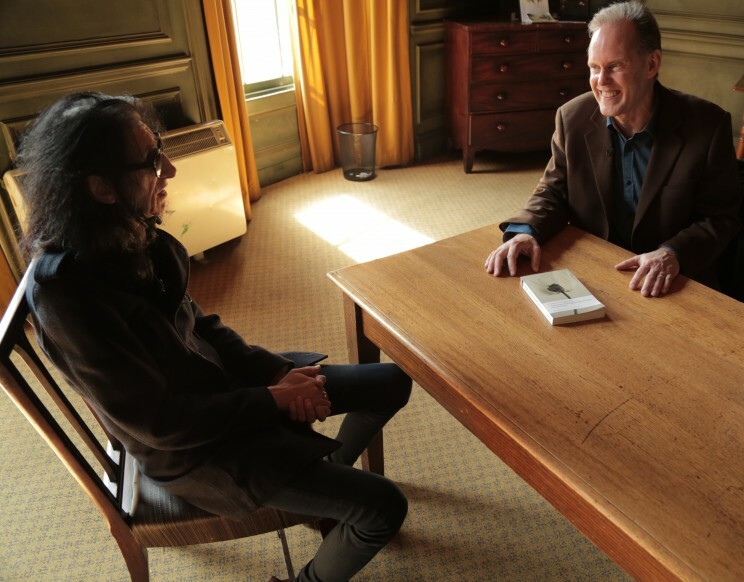 Robert Morrison and John Cooper Clarke, filming, The Secret Life of Books for BBC 4. First, in ‘The Pleasures of Opium’ section, De Quincey describes the euphoria of consuming the drug occasionally and – as we would now say – recreationally as a way of intensifying his enjoyment of solitude, books, conversation, and music. His most obvious heirs in this line are The Merry Pranksters, whose drug-induced adventures are memorably described by Tom Wolfe in The Electric Kool-Aid Acid Test (1968). Then, in ‘The Pains of Opium’, De Quincey reveals how, even as he luxuriated in the drug, it was tightening its hold upon him, until it inevitably pulled him down into addiction, where he endured intense psychic and somatic anguish, as well as lurid nightmares that reduced him to suicidal despondency. William S. Burrough is the most notorious twentieth-century practitioner in this tradition, as seen especially in Junkie (1953), with its nod to De Quincey in its telling subtitle, Confessions of an Unredeemed Drug Addict. Finally, in attempting to ‘kick the habit’, De Quincey reports on his many resolutions to abjure the drug, which soon brought on the fiercer agonies of withdrawal, which in turn sent him fleeing back to opium as the best means of obtaining relief. His intake levels shot upward. His life spiralled out of control once more. He re-committed himself to temperance, even abstinence. The grim cycle began again. De Quincey won several individual battles with opium, but never the war. He published his revised Confessions just three years before his death in 1859, at which time he had been an opium addict for almost fifty years, albeit a remarkably high-functioning one. Clarke’s fascination with – and illumination of – both versions of the Confessions reveal their enormous impact on De Quincey’s age, as well as their burgeoning relevance in ours. Throughout The Secret Life of Books, he highlights a number of parallels between his opiated experiences and De Quincey’s, from their doctor-prescribed use of the drug when they were both children fighting illness, to their many adult promises to quit that started well only to end in relapse. But there is one crucial difference between the two addicts. As the insight, pathos, and humour of the programme fully demonstrate, Clarke did win the war. The Secret Life of Books episode on Confessions of an English Opium Eater will be shown on Monday 2nd November on BBC 4 at 20:00. Featured image: Poppy Pods by Barbara Moss CC0 Public Domain via Pixabay. Robert Morrison is Queen’s National Scholar at Queen’s University in Kingston, Ontario. His book on the British Regency (1811-1820) is forthcoming with Norton. His extensive new selection of De Quincey’s finest writings will be published next year in the 21-Century Oxford Authors series. He is the author of The English Opium-Eater: A Biography of Thomas De Quincey, which was a finalist for the James Black Memorial Prize. For Oxford World’s Classics, he has edited De Quincey’s Confessions of an English Opium-Eater and his three essays On Murder, as well as – with Chris Baldick – The Vampyre and Other Tales of the Macabre. It is safe to say that De Quincey was ahead of his time offering experiences that we find fascinating. As an addict for 50 years, that offers much insight into the world of an opium drug addict.